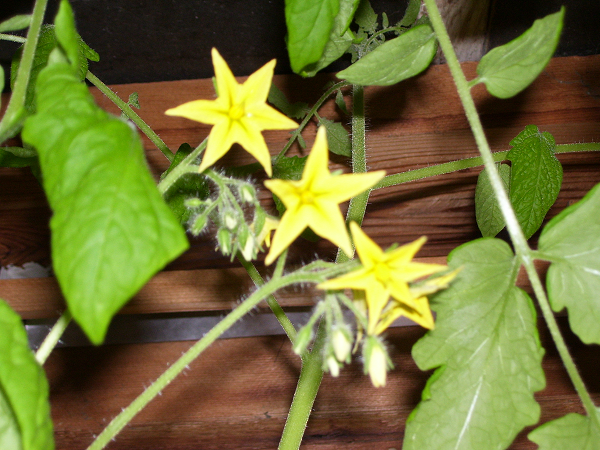 Nothing too very exciting, just some pictures of my crops taken in June and July 2010. How we looked at the end of May/beginning of June. This is shortly after I planted the beds. What you see here is mostly lettuce, 'Grand Rapids' to be exact. I selected this variety because it's readily available. Sorry about the poor quality picture, I took it with my cell phone! And this is July. That's lettuce 'Grand Rapids' in the foreground, behind and to the left (in the same bed) are tomatoes 'Large Red Cherry' that was the name on the seed packet anyway. Who knows what it really is? I paid 10 cents for the seed, they are tomatoes, I'm not complaining. 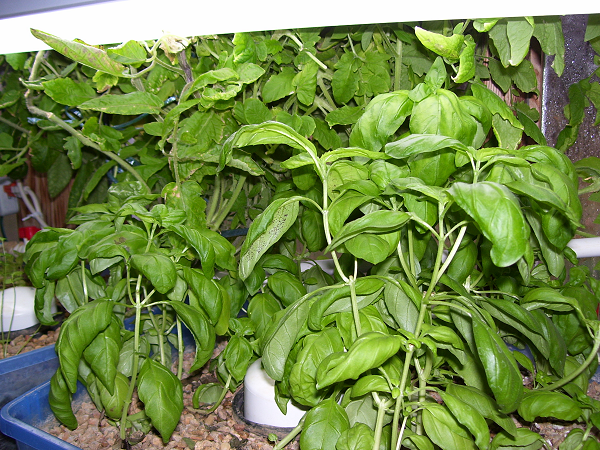 In the background there, in the other grow bed is my basil 'Genovese'. In my opinion, this is the only (green) basil to grow, it's such an outstanding producer and the flavor is delicious! There is also cilantro in that bed, but I ended up pulling it out. It just didn't do well. It was too warm over the summer, there wasn't enough light to make it happy, and it didn't like being so wet all the time. I put the struggling plants in a pot of soil and they did better, but still kept going to seed all summer. Everything is growing like weeds! Shortly after this picture was taken, I harvested the lettuce. It was very tender and sweet, much better than store-bought lettuce. Another shot. You can see how much the tomatoes have grown much better in this picture. I don't have a picture of it, but I planted a couple cucumber seeds in the other grow bed. Took them just a few days to pop up and they are doing quite well. More pictures of plants. I know, such a surprise! A nice picture of grow bed #2. 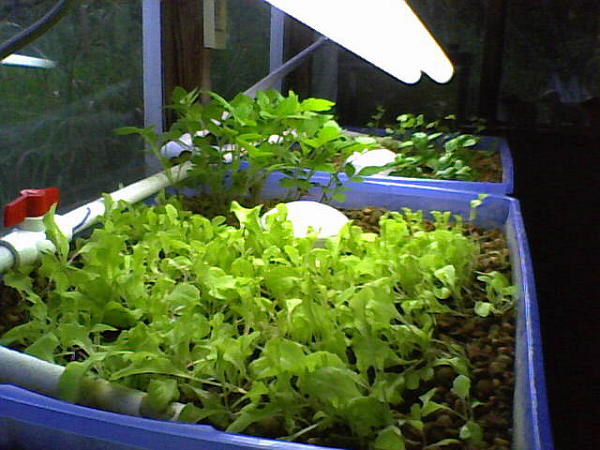 You can see my basil, which had already been harvested twice when this picture was taken. I made a lot of very delicious pizzas out of that basil! Dried the rest of the leaves I didn't have an immediate use for. The lettuce is the pale green plants in the background, tomatoes taking over the top of the picture and the cucumber 'Poinsett 76' is in the middle right of the picture. More on those later. Lookit them 'maters! They are growing like crazy! Matter-of-fact, they were growing too much. Lots of plant, no blooms. 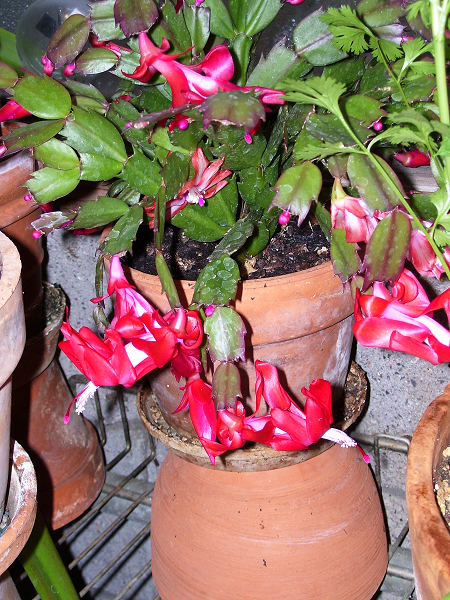 Normally, if I were growing these outside or in a pot, I'd just withhold water. Let them wilt a few times and that will force them to bloom. In this sort of set up, withholding water gets to be a bit more of a challenge. So what I ended up doing was stressing them in much different way . . . I pruned leaves. The plants react to an 'attack' by reproducing, so that if they die (get eaten) at least there will be another generation to carry on. As far as the tomatoes were concerned, I was nothing more than a giant tomato hornworm! 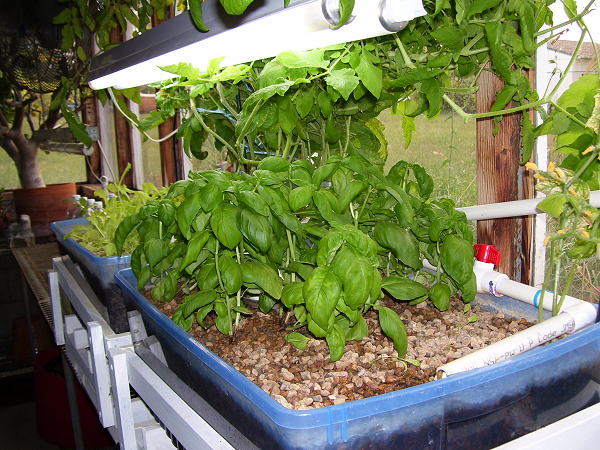 I also took to switching the water to grow bed #1 off at night and on during the day (and vice versa for the other grow bed.) That has also helped enormously for another problem that came up, more on that below. 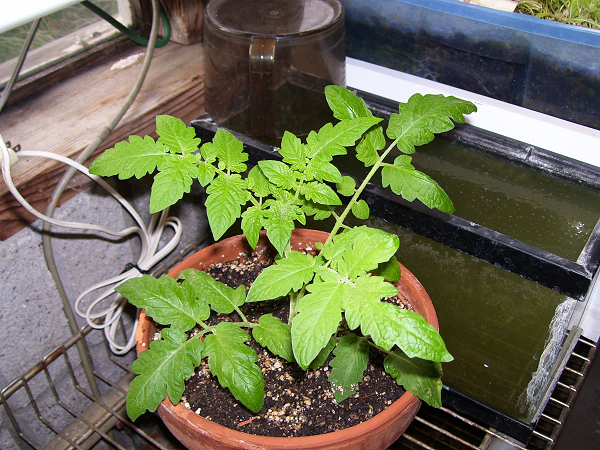 For giggles, I took an offshoot from the tomatoes when I was trimming back leaves, and stuck it in a pot. It rooted immediatly (tomatoes will do that.) 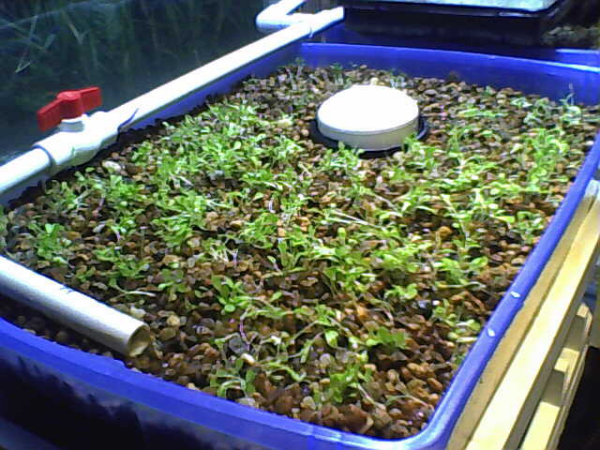 Right behind the pot is my failed attempt at growing some duckweed for the fish to eat. I've been having trouble getting decent duckweed of all things! 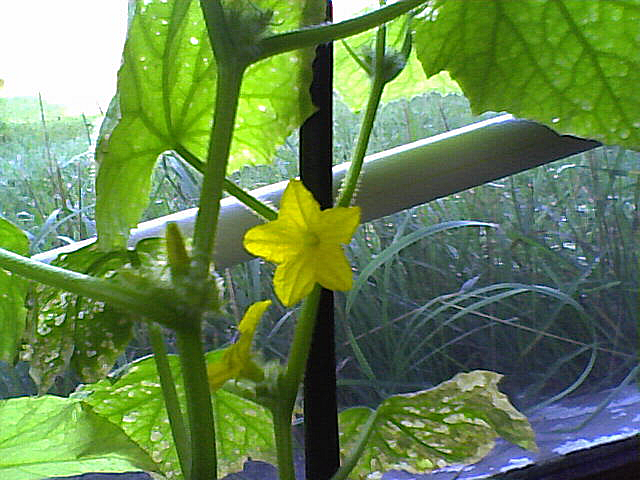 The cucumbers I planted in August are doing very well. 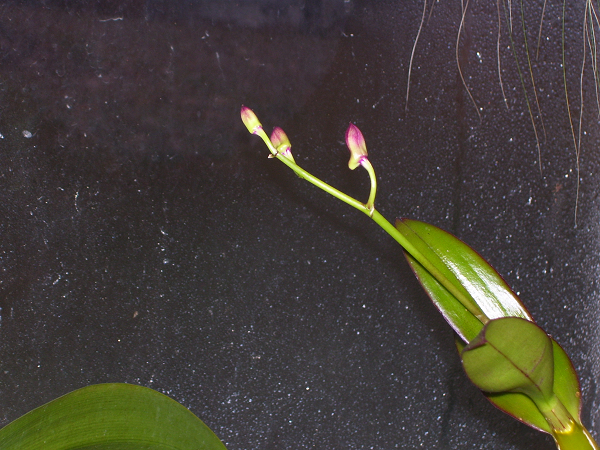 They took off like a rocket and started blooming within a month. I'm not sure why they have those necrotic spots on their leaves however. It doesn't seem to be affecting them adversely, so I'm not going to worry about it too much. Cukes tend to do this sort of thing c'est la vie! It's getting cold again, and the weatherman says it's supposed to be snowing today. It's not, it's as sunny as the middle of July outside, though it is pretty chilly. I could go for some July heat myself! 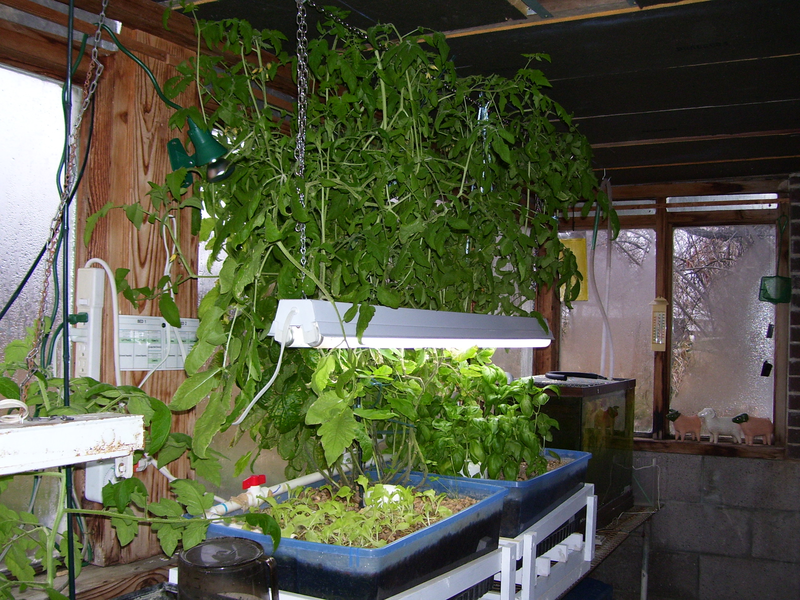 And it just occurred to me that my little aquaponics project is now closing in on a year old. Yeah! A tomato! About bloody time! I guess this is what I get for buying 10 cent/packet seed with generic names on them! The packet said this variety would bloom in 90 days. Nope, try 120 days. But what's an extra month eh? Six of one, two dozen of the other! Now we'll see it really is a cherry tomato, or if I've got a monster 'Beefsteak' on my hands! Eventually, when these plants have run their course, I have some grape tomato seed I've saved, and I'd like to plant some Roma's. I've actually got the plans mainly worked out in my head, and have started gathering materials to make another grow bed. I plan to put peppers in it. BASIL! When these have put on a bit more growth, they will be made into PESTO! Kind of hard to tell in the picture, but some of those leaves are as big as the palm of my hand. Just a long shot of the whole operation. 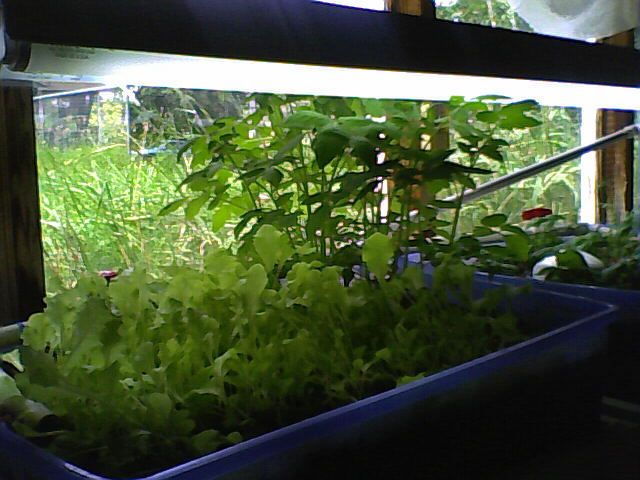 That is my second sowing of lettuce there in the front. 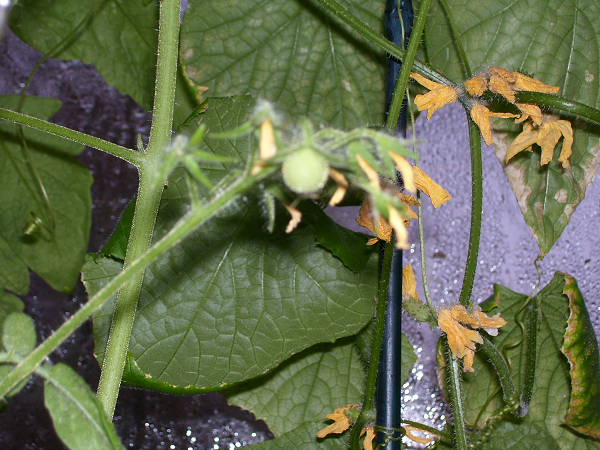 It's not doing so well, and the tomatoes are at fault. The tomatoes have rooted throughout that entire grow bed (to the point I had to pull roots out of the bell valve/drain!) The consequence of that is the water is now draining through the bed really slow now. The lettuce doesn't like having soggy feet at all. So this is another reason why I've got the water to this bed turned off at night - so the lettuce can breath. 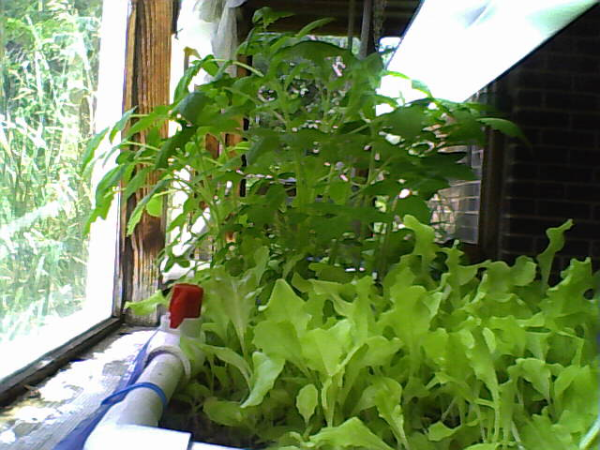 Since I started doing that, the lettuce has been perking up. 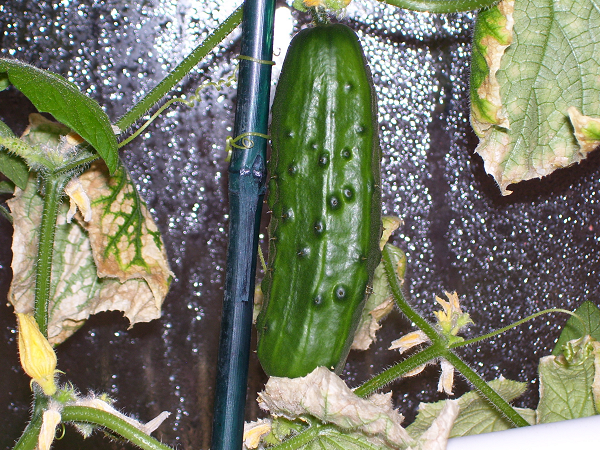 The leaves may look like crap on my cucumber, but you can't argue with the results! This cuke is gowning so fast you can almost see it getting bigger! I really notice the difference in size between closing the greenhouse up for the night, and coming in then next morning to open it up again. 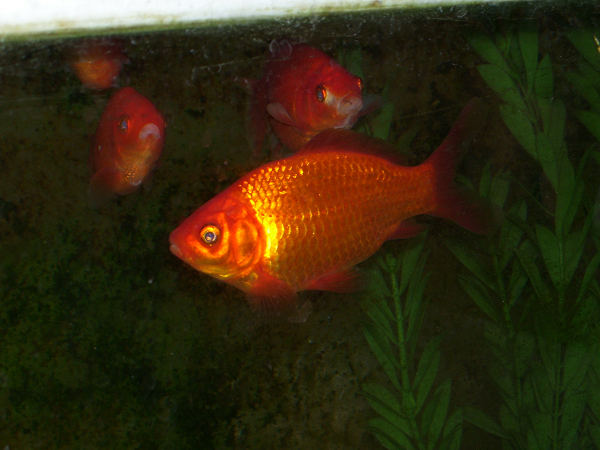 My ''fertilizer technicians'' are getting bigger One thing I have learned in regards to using goldfish for aquaponics, avoid the white ones. They are not nearly as durable as the gold-colored ones. 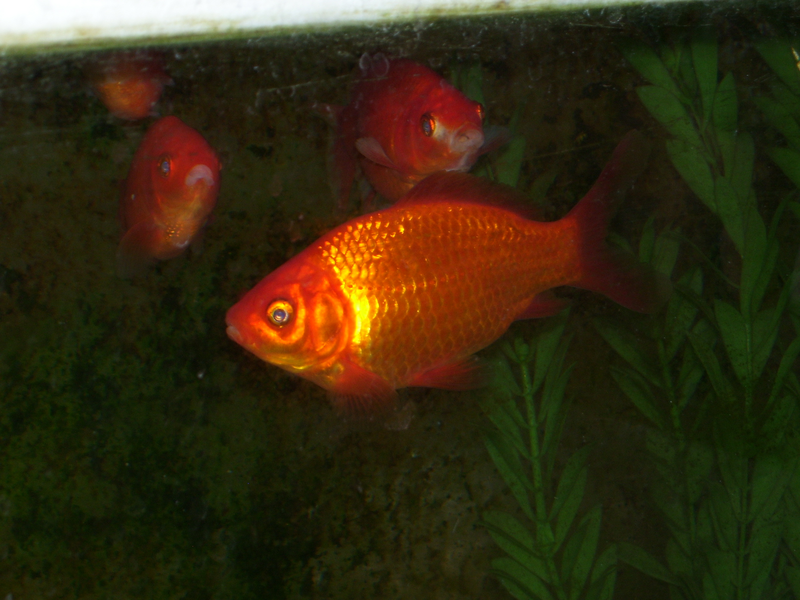 I had lots of problems with the white ones and was constantly medicating them just to keep them alive. They all ended up dying anyway. 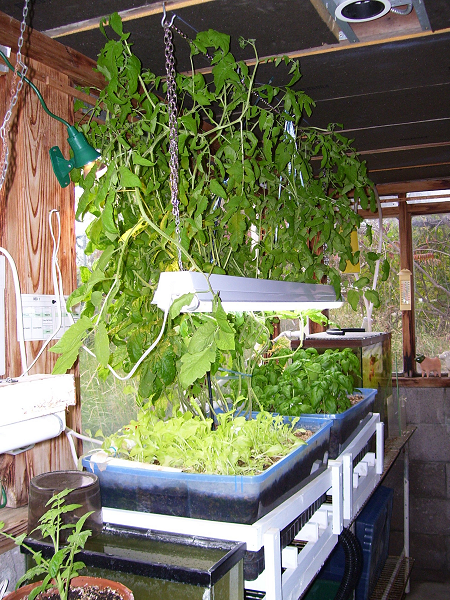 This has nothing to do with aquaponics, just sharing pictures of the other plants I've got in the greenhouse. 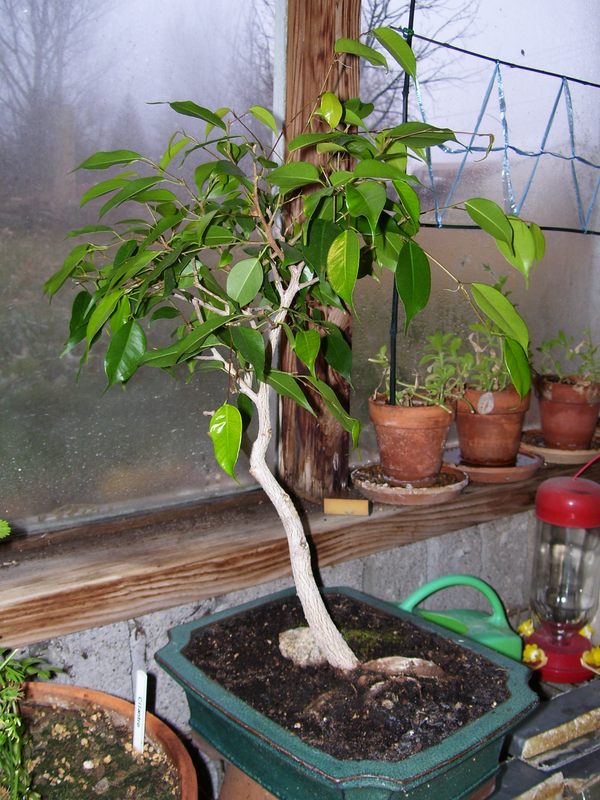 This is the Ficus benjamina bonsai I've been working on. I've finally got some moss to grow on the soil there! That took some effort (moss doesn't generally grow well in Colorado.) I need to pull the whole trunk of that tree down so it looks interestingly tortured and wind swept - the damn thing keeps straightening up on me! I used to have all sorts of kinds and colors of Zygo-cactus, I really don't remember what happened to them all! I found this one on a clearence rack for a couple bucks so I brought it home. I didn't know what color flower it would be either, but I was hoping for this particular color, so I got lucky!